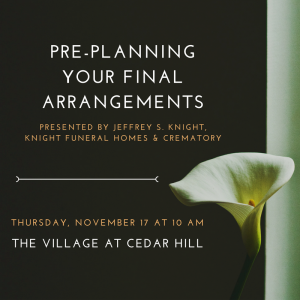 The Village at Cedar Hill is pleased to host the next presentation in their popular Speaker Series, “Pre-Planning Your Final Arrangements” presented by Jeff Knight owner of Knight Funeral Homes and Crematory in White River Junction and Windsor VT.
Jeff is the owner of Knight Funeral Homes and Crematory in White River Junction and Windsor. He is a third generation funeral director whose family has been serving the families of the local area for 75 years. He graduated from the University of Minnesota as a J.M. Nolte Scholar, with degrees in Management and Mortuary Science. He worked at a Minneapolis funeral home for a time before returning to Vermont to work with his family, where he has been practicing funeral service and operating a crematory for the past 25 years. Jeff has been a member of area civic groups, served on various boards including local cemeteries and was appointed by Governor Shumlin to serve on the State of Vermont Organ and Tissue Donation Working Group. 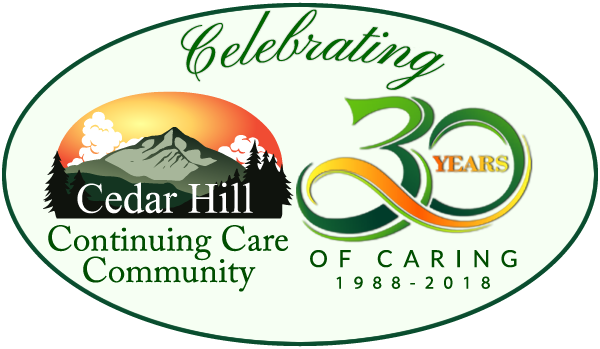 Following the presentation at our senior living center, there will be time for questions or comments. Refreshments will be served. Admission is FREE.